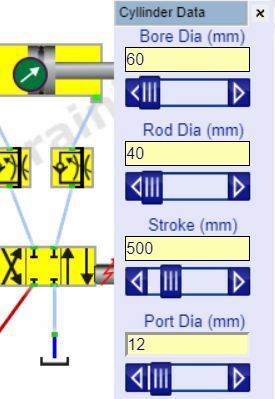 Set the cylinder bore, rod size, stroke length and port size in the cylinder data window. All dimensions in mm. The program tries to move the cylinder at the speed it would move in real life. Clearly, when you change the stroke, the image does not change, but we know the flow rate and cheat a bit and move the cylinder based on its actual length e.g. if retracted to extended takes 10 seconds, then if you double the stroke it will take twice as long to move. This approach is not perfect but it's nice to have an impression of how quickly the actuators move. You can apply three different types of load on the cylinder. The top box is for the effective mass. This is simply the mass in kg that the cylinder will move. However, if the mass is on the cylinder is driven through a mechanical linkage you will need to adjust this by the radius to give the effective mass. The cylinder angle is important to calculate the load for the mass and is measured in an anticlockwise direction. Zero degrees is horizontal, 90 degrees is with the mass acting down onto an upwards rod. A horizontal cylinder would not apply a static load as there is no sliding friction factor, you would need to add this as a separate frictional force. Alternately the load may be in the form of a constant force rather than one generated by a mass. 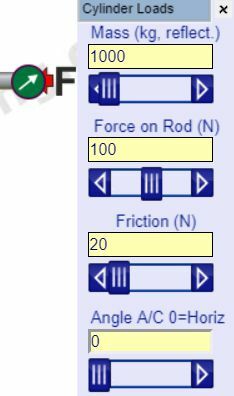 The force is assumed to act onto the rod and should be negative if pulling (extending) the rod out of the cylinder. A friction force will always act against the movement of the cylinder. Typically this might be equivalent to 3 to 5 bar of cylinder pressure. 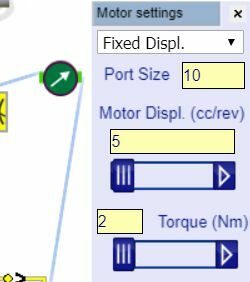 Left click on the motor model to open its settings. Motor types are selected from the drop-down list. Port size, in mm, is used in the system pressure losses. Motor displacement is set in cc/rev. The load on the motor is set by a constant torque value.